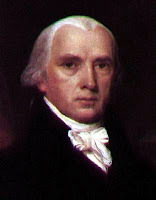 In order to stop British troops from harassing American ships in trade, Madison thought that it would be a good idea to invade and seize Canada, sovereignly ruled by Britain, in order to obtain a good bargaining chip for establishing U.S. neutrality on the seas. Only, he didn't prepare very well to engage in this battle, and the War of 1812 killed 2,260 American troops over the next three years. Even with this, U.S. neutrality on the seas was still not recognized until Britain's war against Napoleon ended in victory.